Juntaro Higuchi (Naohito Fujiki) is not only a soba shop waiter, but he is also a talented detective who can solve various tricky cases with his unique ability to see through lies, even though he has never expected to be like that. Worried about Juntaro’ s way of life, his sister and psychic, Itako (Keiko Horiuchi), comes to his place from Osorezan, a holy mountain where spiritual mediums live. 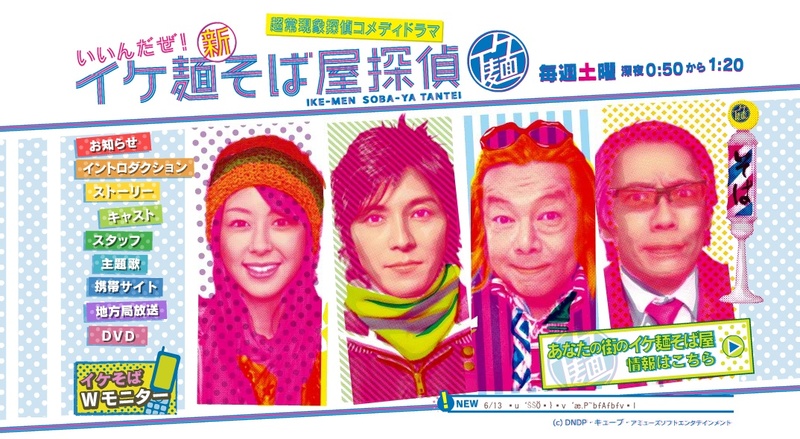 Following Itako’s prophecy, Juntaro sets up his soba stand at different places together with two other IKE-MEN - nice looking guys – (Nobuo Kyo, Kazuma Kawahara). One day, Juntaro delivers soba on his beloved bicycle as usual. Then he happens to get involved in a case and even mistaken as a criminal by Kuroda Kinzo (Katsuhisa Namase), who used to be a manager of a talent agency, Ikeda Talent Promotion, one of Juntaro’s customers. Juntaro manages to escape by the skin of his teeth. While he is running away from the site, he meets by chance with Masahiko Ikeda (Arata Furuta), president of Ikeda Talent Promotion... Unique people come to him bringing strange and funny matters for him to solve. With his exceptional ability, will Juntaro be able to solve them? Or not...? This is a mystery drama in which there are a lot of Laughs, laughs, laughs... and more!